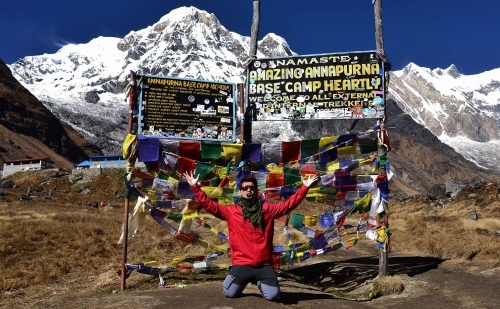 Annapurna Base Camp Trekking is famous trekking trail in Annapurna area. 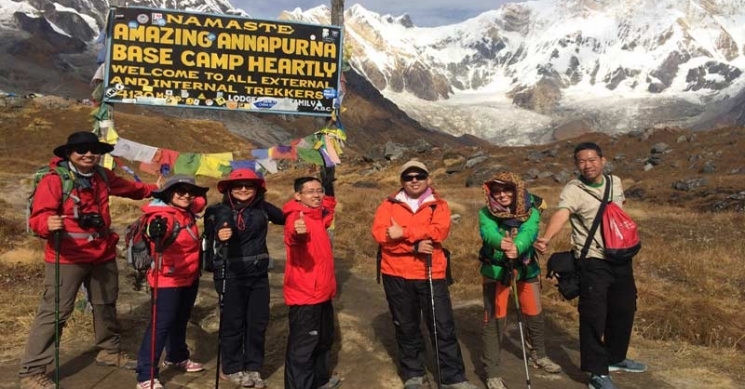 Annapurna Base Camp Trek takes us through wonderful views of mountains in the Annapurna series, Hiunchuli, Gangapurna, Machhapuchhre et cetera. 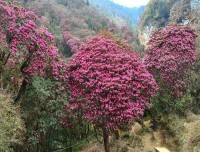 Rhododendron forests and terraced fields form a beautiful backdrop during the trek. 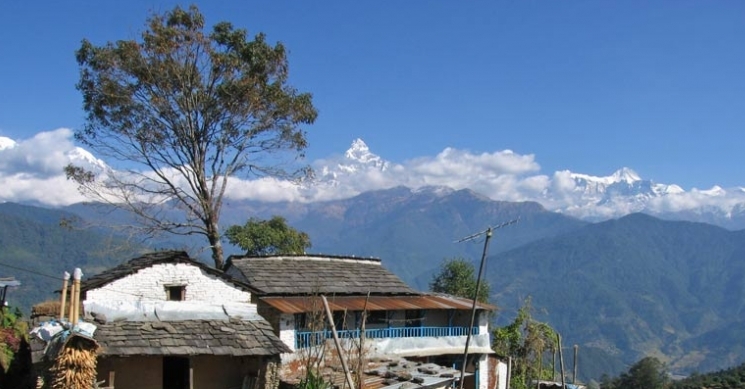 The Gurung villages in the trail give an insight into the tradition, culture and lifestyle of these highland dwellers. 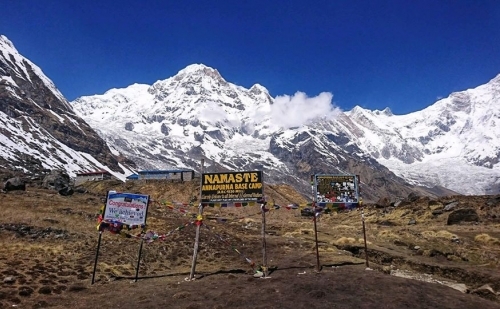 Annapurna Base camp trek is considered of moderate level and is without much altitude gain, so it is not prone to altitude sickness. 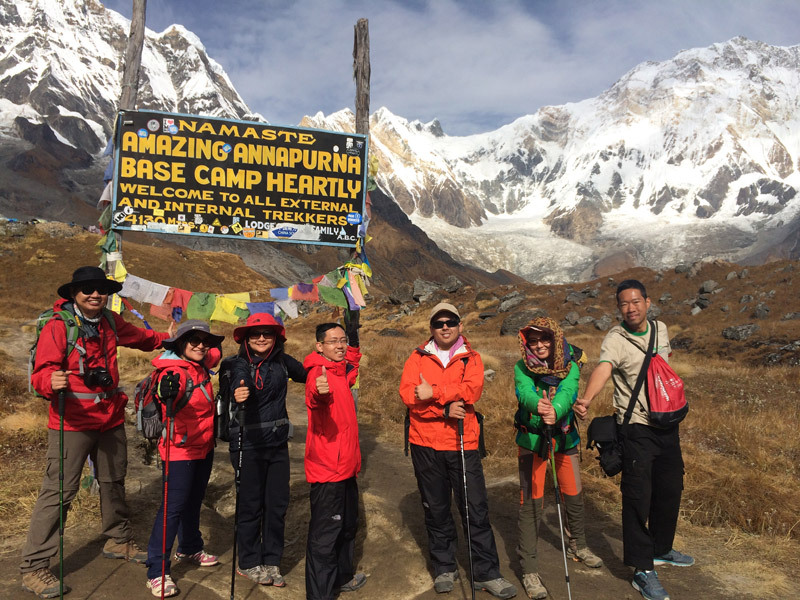 Annapurna Base Camp Trekking, a journey to the base camp of the 10th highest peak in the world, Mt Annapurna is one of the most popular treks on earth! 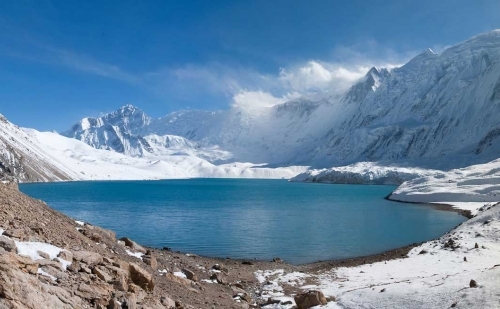 Blessed by nature with amazing landscape, waterfalls, hospitable ethnic villages, farmlands along the hills, rhododendron forests and above all, towering snow clad mountains, the trek is a heavenly experience. 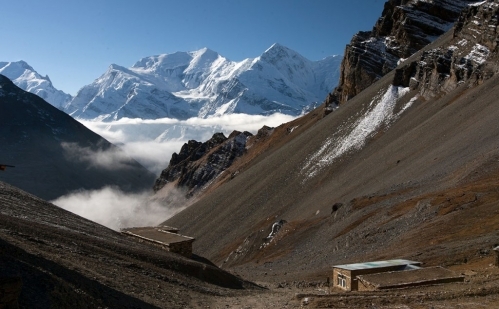 As the route does not reach high altitudes, altitude problems are less likely. 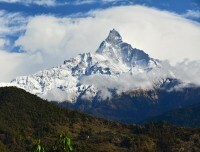 From Kathmandu we drive to Pokhara, a beautiful city known for its scenic beauty and numerous lakes and stay overnight. A short drive from here takes us to Nayapul where our trek begins. 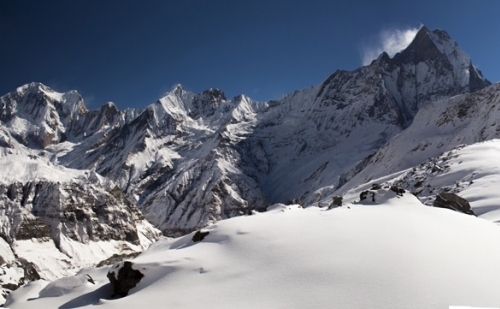 The walk along Tikhedhunga, Ghorepani, Tadapani and Chhomrong to the Annapurna Base Camp is a thrilling experience. Rhododendron, oak and bamboo forests pass on the trail, and the view of the majestic mountains become lustful after each stop. At Poonhill, the most amazing view awaits, a panorama of more than ten mountain ranges drowned in the beautiful sunrise. The return journey is through Jhinu hot spring, Nayapul and back to Pokhara. Day 1 :Arrival in KathmanduOur Airport Representative will meet you at the Tribhuwan International Airport. A drop to the Hotel by private tourist vehicle is arranged. 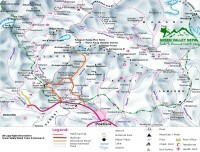 You can either take a rest or meet us at our office and know the detailed arrangement of the Trek. B&B at the hotel. Day 2 :Drive from Kathmandu to Pokhara (884m) by Tourist BusAfter breakfast, we drive to Pokhara which is 200 km from Kathmandu. We take our lunch in between this six hour bus ride. You can also opt for a flight which takes about 30 min, and then explore Pokhara, renowned for its scenic beauty and lakeside stays. 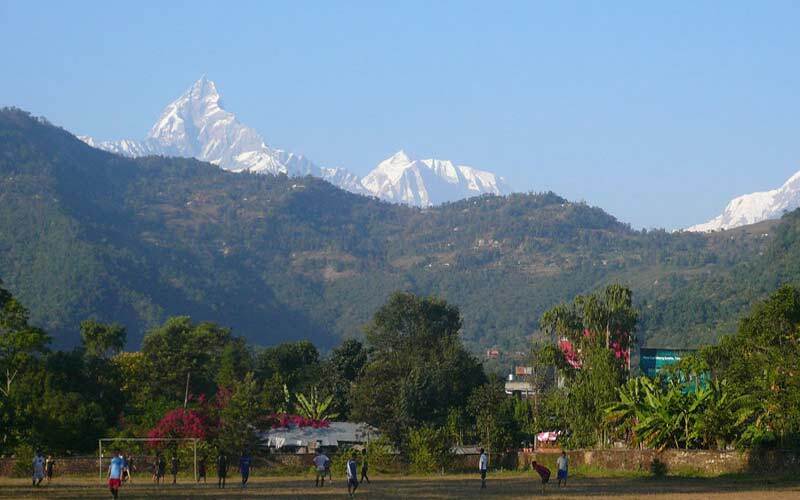 Overnight stay at a guesthouse in Pokhara. Day 3 :Drive to Nayapul from Pokhara, and then Trek to Ulleri (2073m)From Pokhara, the drive to Nayapool takes about an hour. Our trek begins from here. After a short walk along the banks of Modi River, we reach Birethani. Small teahouses are in plenty along the route. After crossing a village, we climb to Hille and then to Tikhedhunga. We then take a steep ascent up to Ulleri, a large Magar village, which is rather challenging. Overnight stay at Ulleri. 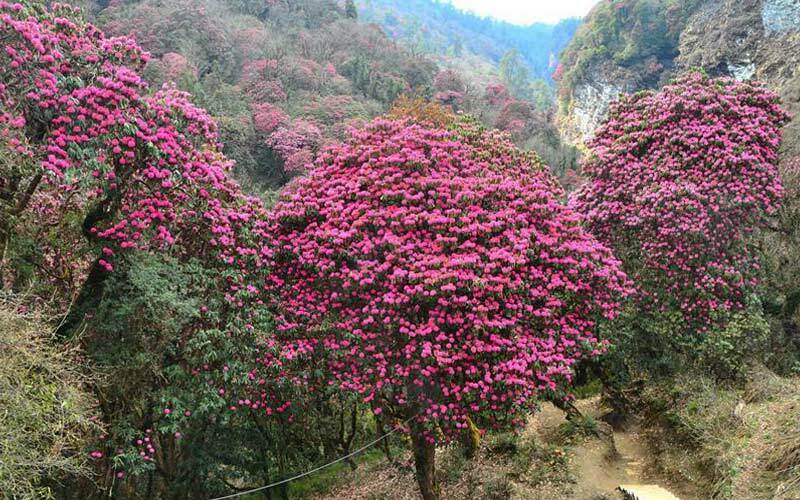 Day 4 :Trek from Ulleri to Ghorepani (2856m) From Ulleri, the trail is a gentle ascent and we pass through rhododendron and oak forests to reach Banthanti. 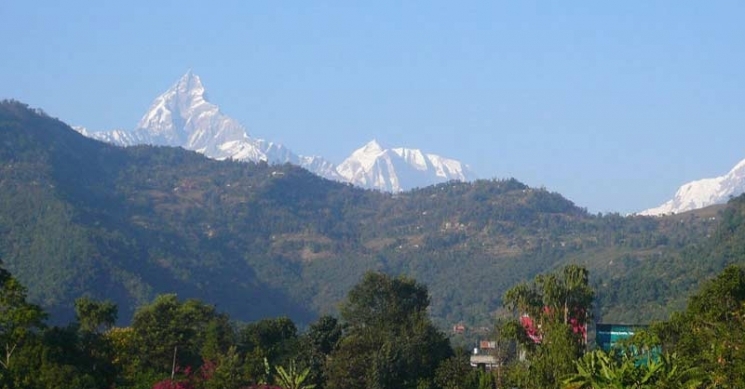 A couple of hours from here and we reach Ghorepani. 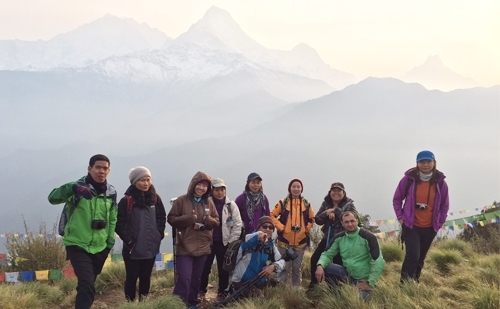 Ghorepani stay is popular for the Poonhill hike which presents a spectacular view of the sunrise and a superb panoramic view of the mountain ranges. Overnight stay in a guesthouse. Day 5 :Trek from Ghorepani to Tadapani (2625m) Today's journey begins with a short hike to Poonhill, the best viewpoint in the trail and unmistakably a photographer's paradise. A 45 min walk takes us to the top of the hill which is at a height of 3210m. 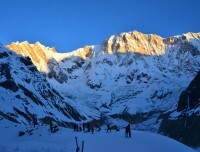 We return back to Ghorepani for breakfast and then move to Deurali along a steep strenuous climb. The walk from here to Banthani is an easy jungle route where we may come across monkeys and Langurs. Further down, we reach Tadapani, our stay for the night. Day 6 :Trek from Tadapani to Chhomrong (2020m) After breakfast at Tadapani, we move down gradually along forests of rhododendrons, cross the Kimsung River and ascend to reach a Gurung village called Gurjung. 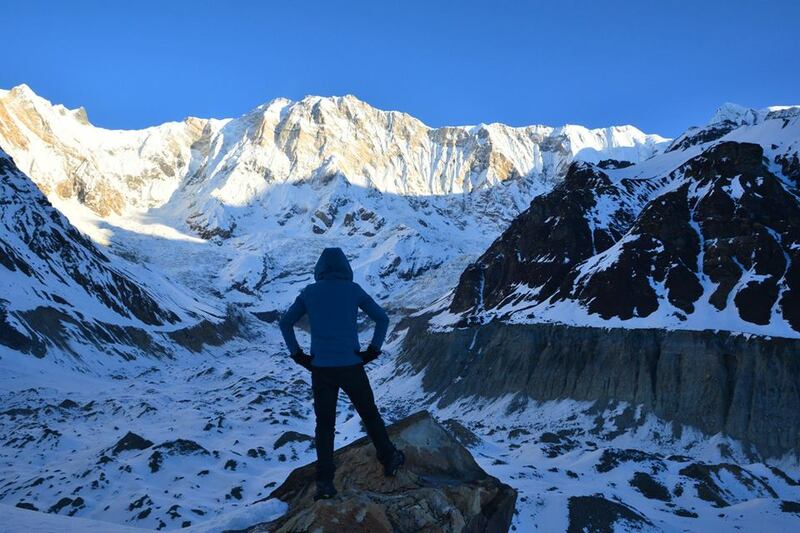 From here, a straight climb takes us to Chhomrong, a beautiful village situated in the lap of the Annapurna. Overnight stay at a guest house. Day 7 :Trek from Chhomrong to Dovan (2580m) Stone steps from Chhomrong drops down to Chhomrong Khola, where we cross a suspension bridge. Then we take a steep climb to Sinuwa. After a short walk along the jungle, followed by an easy downhill, we reach Bamboo. Passing the damp bamboo forest, we take the steep descent to Dovan, the bottom of a gorge. Day 8 :Trek from Dovan to Deurali(3230m) The walk from Dovan to Himalaya is a silent one as big noises are not allowed in the jungle in regard to a temple on the way. 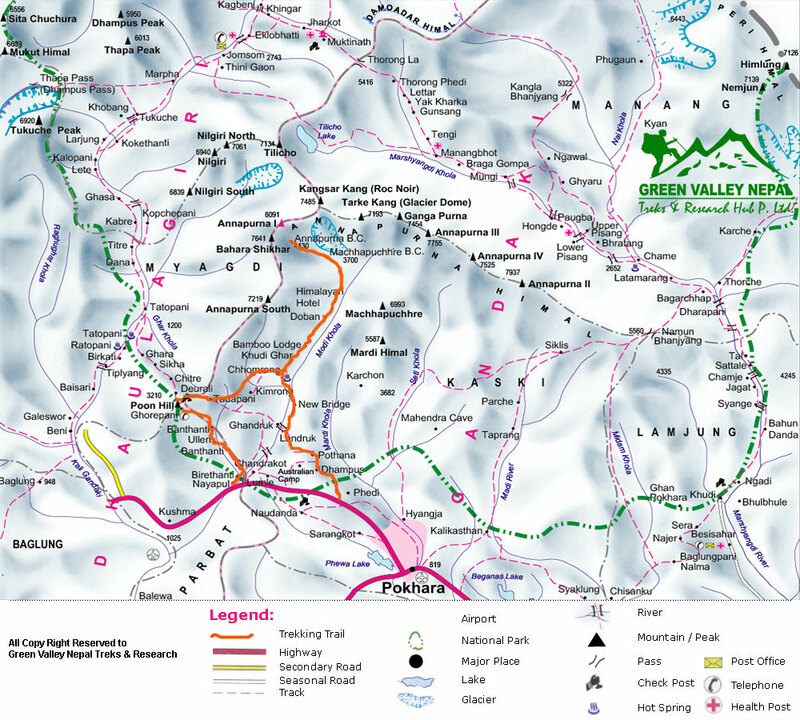 The route first comprises bamboo forests and then changes to rhododendron forests and contains plenty of waterfalls. 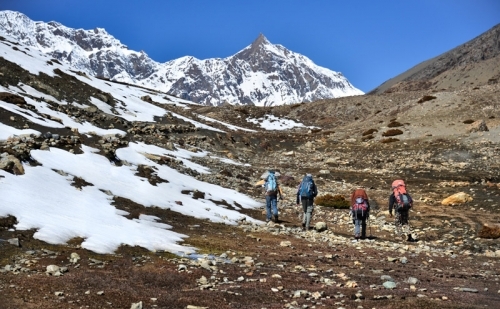 Upon reaching Himalaya, clearings appear and glacial rivers are visible along the trail as we ascend to Hinku cave. After a short walk, the trail first drops to the river and then ascends again to reach Deurali that offers exotic views of the valley below. Overnight stay at a guesthouse. Day 9 :Trek from Deurali to Annapurna Base Camp (ABC)(4131m) From Deurali, the trail passes through a river bed, and after a tedious climb, we reach Machhapuchhre Base Camp. Surrounded by mountains on all sides, views of Annapurna, Machhapuchhre, Gangapurna, Himchuli et cetera are very rewarding. The way to ABC is wider with scanty vegetation. 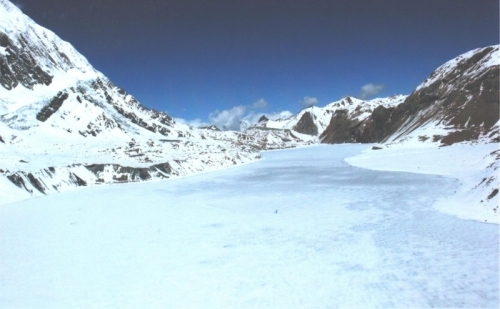 As the area is prone to avalanches, caution should be taken on possible dangers. Up from MBC, mountain views unveil to clarity. Annapurna Base Camp gives an awe-inspiring view of the snow covered mountains including the Annapurna range, Singuchuli, Macchhapuchhre, Tent Peak et cetera. Overnight stay at the base camp. 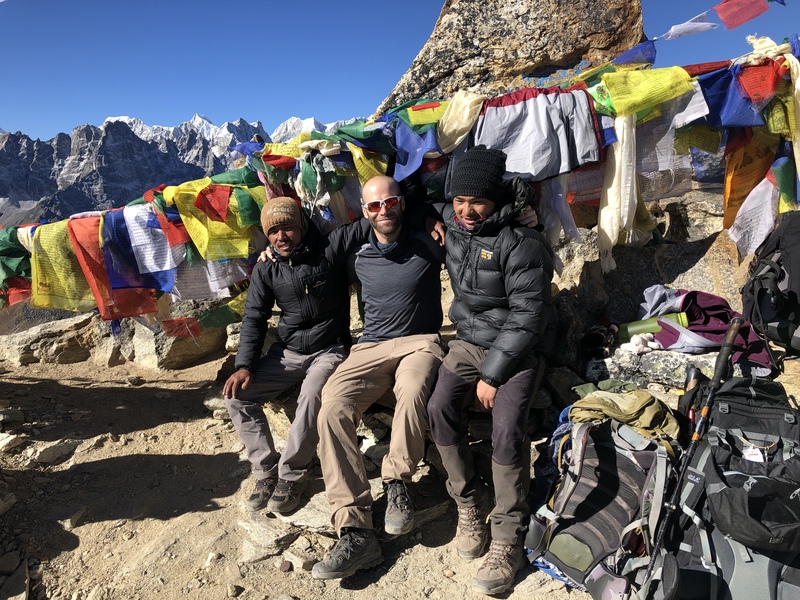 Day 10 :Trek from ABC back to Sinuwa (2340m) After viewing a spectacular sunrise from ABC, we head back following the same trail through MBC, Deurali, Himalaya and Bamboo all the way to Sinuwa. Mostly downhill, the trail is an easy walk. Overnight stay at Sinuwa. Day 11 :Trek from Sinuwa to Jhinu Hill(2170m) From Sinuwa, we move ahead to Chomorong. After a descent of about 45 min, we reach Jinuwa Guest House. Jinuwa is known for its natural Hot Spring where you can take a relaxing bath. The spring is a 30 min steep walk from the guesthouse. Overnight stay at the guesthouse. Day 12 :Trek from Jhinu Hill to Nayapul (1070m), and then Drive back to Pokhara(884m) Taking the route along the Modi Khola, the relaxing walk continues for about five hours as we reach Birethanti and then to Nayapul. 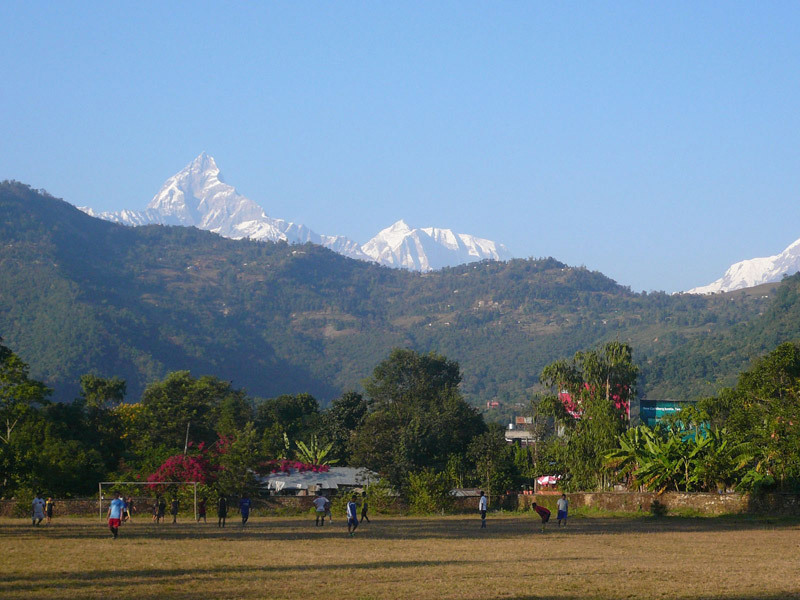 From Nayapul, we drive back to Pokhara and stay overnight in a guesthouse. Day 13 :Drive back to Kathmandu from Pokhara (884m)Returning from Pokhara to Kathmandu, you can explore around the city. We have a small farewell dinner, celebration for the successful completion of your journey. Overnight stay at a hotel. Day 14 :Transfer to Kathmandu International Airport or onward for next program Departure from Kathmandu. A drop from the hotel to the airport 3 hours before the scheduled time of flight is arranged in a private tourist vehicle. 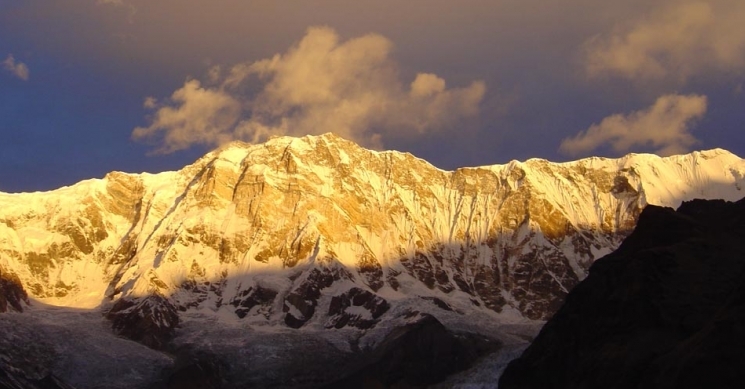 You can also opt for a longer stay in Nepal or set on another journey with us.